Spoof news: Cheney Donates 'Special' Materials To Bush's Presidential Library. Cheney Donates 'Special' Materials To Bush's Presidential Library. 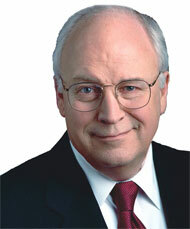 A Photo Of Cheney Smiling- Creepy, Isn't It? I hope you don't mind me still using your secret pet name that we all used while you were still in office. I am happy to hear that you are enjoying your retirement since the end of the presidency shooting rabbits and catching up on the comics you missed. The Prince by Machiavelli- This is THE book! It sums up my entire political career beliefs. I sleep with it under my pillow. The Godfather- My ideal and my hero. Often, when faced by a difficult decisions, I ask myself "What would Corleone do?" Any of Tom Clancey's fine, patriotic books will do. I haven't read any of them, but have seen the movies which is good enough. They always have the flag on the cover which is a good thing. I find the books of the Marquis de Sade to be inspiring. He had such a fineness and exquisite taste for inflicting pain that transcends normal procedures. I find myself getting seriously aroused when I read them, which is not a common emotion for me. The Bible I find to be a true source of inspiration, at least the violent parts any way. Dr. Strangelove is a fascinating read. It's eerie- its almost as though the author had really been in a Cabinet meeting and knew what it was actually like. Prisoner Without A Name, Cell Without A Number gives one a good idea of what it is like to be an falsely charged, oppressed, tortured, forgotten political prisoner. It gave me ideas on how to break them down more efficiently. The Koran gives me insights into our enemies. It also has some cool violent parts. On a personal level, I find my rewrite of the Army Field Manual to be a far superior version. No more of this wussie weeny torture stuff. My copy has the real blood and guts stuff. Lastly, I've been reading Obama's books. It always pays to know the enemy. I comb it for weaknesses. Have the FBI go over the underlined parts. If only J. Edgar were still around. That's all I got for now. Enjoy.